Hat is a hi-hat cymbal with a wild side. Finding something unique is easy with a blend of sounds ranging from robotic to metallic. At its core are three unique sound sources made up of six oscillators, a noise generator, and a number of filters. Sizzle affects each source independently, adjusting oscillator and filter frequencies, allowing for a broad range of sounds. 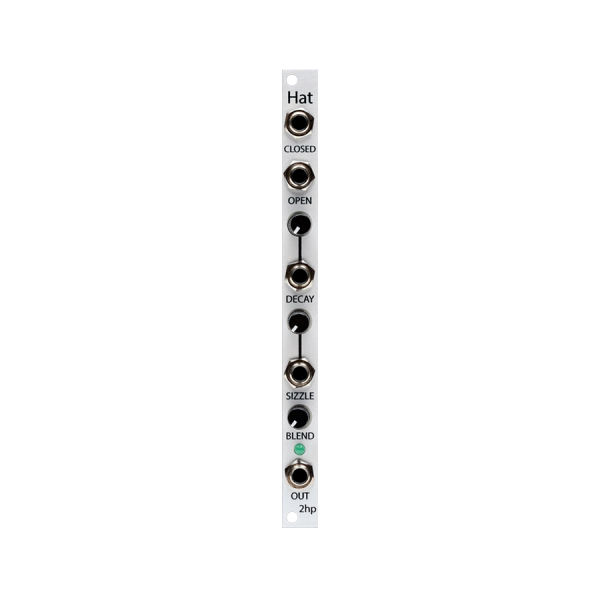 In addition, separate trigger inputs for open and closed allow for a complete hi-hat pattern on a single module. No matter what situation it's in, Hat provides shimmering, metallic timbres for any percussive purpose.